Of the two cars you are currently considering, the RAV4 would be my choice based on its excellent record of longevity. Read on if you want to look at other models. Since you are a current, happy GM owner, there are a several GM fans/experts that frequent this site who I'm sure will give you the low down on what might work from GM. 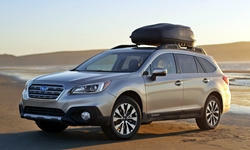 I'm gonna be the contrarian here and suggest you not overlook Subaru. They tick off your boxes and their CVT is actually pretty good - considered one of the best by most. The bonus that while not a lot of SUVs in your price range have a full set of modern safety features many 2015 -16 Subarus do. 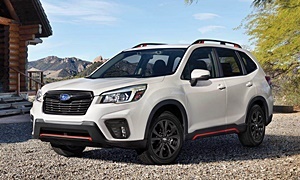 You should be able to find a good used 2015-2016 CPO Forester or Outback with an extended warranty within your price range. Their apparent Achille's Heel is that somewhere between 5-10% burn oil and may need a quart every 2,000-4,000 miles as they age (2-4 yrs). However, actual engine failures are rare as long as one knows how to check the dipstick, do it regularly & top up the oil as needed. Given you currently drive a couple large GM sedans which are known for their comfort, you would probably prefer and plusher Outback over the more utilitarian Forester. I would kick out the Edge because reliability hasn't been great. 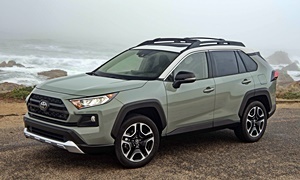 RAV4: You choose this one if reliability is important. The ride is smooth in the 2016 and newer ones. 2013-2015 had harsher rides. It is just a little bit slower than the 4cyl Edge. It gets better mileage than the Edge. All the safety systems will be on the Limited trim. You'll probably get 100k miles more out of the RAV4 than the Edge. Everything is tried and true and works. Edge: Reliability isn't as good. It drives smoothly like the RAV4 and handles better than the RAV4. It weighs 600 pounds more than the RAV4 and therefore gets lower MPGs than the RAV4. The Outback might be a good fit like Dan said. I'd skip the Forester because it is kind of a tin can. 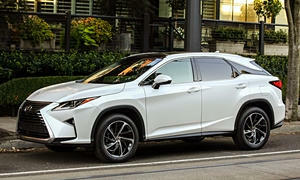 Take a look at a 2012 or newer Lexus RX350. They will give you more life than the Edge and they are more quiet and comfortable. Look at the CPO Outbacks with the 7 year/100k mile powertrain warranty. Toyota and most other brands have the same CPO warranty, but some have comprehensive warranties. I would recommend the 2015+ Chevy Equinox because it is quiet and soft riding, but there is really no reason to get one because the RAV4 does those things, is more reliable, has more features, and is a little more reliable. The Buick Envision Premium l fills your requirements and offers more luxury trimmings than all of those already mentioned for $28,000 with 17K miles and longer CPO(certified preowned) warranty. We have a 2016 and love the reclining and siding rear seats to accommodate cargo, cargo and adults or the dogs with the rear seats slid forward for about 35 cu ft of cargo holding in the rear or slightly less than Edge's 39 cu ft behind rear seats. We see 32 mpg at 65 mph with our Envision 2.0T and it handles exceptionally well but still retaining a smooth and quiet Buick ride. The Active Twin Clutch AWD is one of the best systems as it can send 100% torque to a single wheel while the others slip, no buttons to push or modes to enter as it is always on and ready. This 2016 Envision is $28K with CPO and 17K miles while a new can be purchased for $33-34K they hold their value very well and include leather seats with heated front and rear seats along with heated steering wheel, hands free lift gate, cross traffic alert when backing out of parking space, forward collision alert, back up camera with steering wheel guided lines, blind spot alert as well as radar parking sensors front and rear, front vented seats, trizone climate control you can control from the front or rear passengers can control on their own. CPO 2016 Buick Envision Premium I for sale at The MJ Sullivan Automotive Corner in New London, CT for $28,225. View now on Cars.com. Could not agree more with NormT's reccomendation for a Buick Envision. The Buick will give you way more "bang for your buck" for $28k than the Rav or the Edge, as the Buick is a true luxury vehicle. After test driving an Envision, I can say that it rides smoother and quieter than my parents' 2015 Rav. If I were you, I would at least consider an Envision- you might be surprised. I would stay away from the Edge. Reliability with the latest gen has been spotty. The Rav is a reliable vehicle that will last for many years to come. (And with only 23k miles on the clock...) However, the Rav is a somewhat boring vehicle to drive. I would strongly recommend looking at the Envision with the 2.0T engine, and if you don't like it, that low mileage Rav sounds like a great option for you. Hello Envision Recomendations:(a copy and paste for another response too Thanks) just to get back to everyone. Never buy a GM vehicle for MSRP. There is almost always a rebate/discount going on. Also be sure to shop around at other dealers too. I would recommend using cars.com to shop new and used vehicle listings. When I purshased my Enclave a few years ago, my local Buick dealer was listing them at MSRP (and they didn't even have the color I wanted!). On cars.com, I searched within 100 miles of my location for my dream Enclave (color, options, etc.) and found it- for almost $7k off MSRP! Toyota (and almost any foreign cars, for that matter) very rarely will have such steep discounts as Ford and GM do. Never take the first quote you get from a local dealer. Cars.com ended up saving me $7k! Good luck with your search for a new car! mkx-models had good advice. I'll add that you should look everywhere. I have never bought a new car that was shown as an online listing because all of our new cars have been on backorder. Our most recent used car purchase was done through looking at the actual dealer's website because it was not on any of the other websites (cars.com, Edmunds, CarGurus, Autotrader, etc.) and it turned out to be an excellent CPO car in great condition at a good price. You'll want to look on both these car-buying websitesand the dealers' websites. GM usually has the best rebates and their reliability deficit compared to most Asian brands is not significant when you save all the money from the rebate that could go to future repairs. This was AcuraT's (another Envision-owning member) logic. You said you want to keep the car for another 10-15 years. GM has changed their cars a lot in the past few years and thus only have a few years of proof of how they hold up, but this is initial quality and not reliability. We have current proof of how 15 year old GM cars hold up and that isn't promising because most of them were terrible. We have proof that Toyota and Honda have made great cars since...forever. GOOD Point on the over time maintainance..I may have over maintained my cars..sometimes replaceing a starter for example at 110,000 miles just because its key and part of winter starting..with a manufacturer model...but ya my wifes 1998 3.1 motor was terrible and springs breaking/suspension..oh a Malibu...reliability really does mean a lot. There is nothing wrong with the Lexus. As long as you aren't looking for sporty driving dynamics it is a fantastic car. It has also been the best selling luxury vehicle in the country for a while now. It is quiet, comfortable, and reliable. The V6 is buttery smooth and tried and true. It isn't a turbocharged 4 cylinder, which is becoming the norm. It seems like it would be significantly more expensive than the used Envision and RAV4 since Lexuses don't depreciate quickly. Lexus builds very reliable vehicles. My friend has a (I believe) 2005 RX330 with well over 200k on the clock and it still runs like new. The third generation RX (2010-2015) will be nearing a decade old, and little was done to the 2015 model to differentiate it from the 2010 other than a modest front refresh. You originally stated that you wanted a "big, clear display" and "ease of use controls". Unfortunately, the third gen RX was widely criticized for it's lacking infotainment system. It was found to be very unintuitive and used a confusing, mouse-like setup (not a touchscreen). 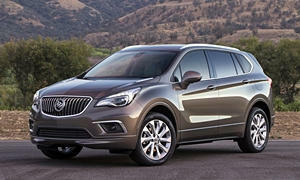 The Buick Envision was all new for the 2016 model year, so of course it will include all of the latest tech features. Not to mention, the Envision includes GM's praised Intellilink infotainment system, which is often credidited as one of the best in the auto industry. Upper trim levels of the Envision can even parallel and perpindicular park themselves! "Toyots Tax"....comment of the day.